The castle of Haut-Koenigsbourg is situated in the middle of eastern French region Alsace. More precisely, its located 26 km north of charming Alsatian city Colmar, 55 km south of Strasbourg, and 12 km west of Sélestat. You can reach the castle either by road, or by a shuttle bus. If youre taking the road, follow the motorway A35 and get down at exit 17 via Kintzheim, or exit 18 via Saint-Hippolyte. Free parking spaces are available around the castle. The shuttle bus operates six times a day (every day in July and August, and only during the weekend from March to November 11) between the castle and the main railway station of Sélestat. One return ticket for adult cost 4, and 2 for a child below 18 years of age. The ticket is valid the whole day. However, the reservation of a place in the shuttle-bus is advised, especially during the weekends. The castle was built in a very specific manner  actually, in a way, it was carved in into the rocks standing on the top of the mountain as to preserve its natural strategic and defensive position. 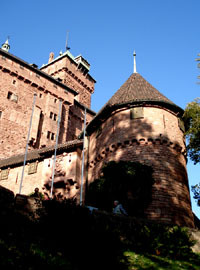 Although rebuilt in 19th century as a replica of the original castle situated on the same spot, Haut-Koenigsbourg offers a unique and indeed authentic impression of castle life led during the middle ages. The castle is divided into two parts  the upper and the lower courtyard. The upper part, the one which is today a private part of the castle, was reserved for the owner of the castle, his family and their highly ranked guests. The lower part of the castle was the home of craftsmen, servants and their families, and also a place where accidental travellers could find a warm refuge to spend a night in. The castle, due to its quite isolated position and common sieges, owned its own windmill, animal farm and storage rooms with wine, wheat, and other groceries essential for the life inside of the walls. All of this can still be seen today. The castle was built by Frédéric le Borgne, duke of Souabe and a member of the Hohenstaufens family, who wanted to reinforce his power in Alsace by building a defence line made of castles placed all over the region. Haut-Koenigsbourg was built somewhere around 1147, on a 700 metres high peak of a mountain which proved to be the ideal strategic position for observing the Alsace plain stretching below it. During the Thirty Years War (1618-1648), the castle was conquered by the Swedish army fighting against Hapsburg monarchy, and was burnt to the ground. After that, Haut-Koenigsbourg stayed untouched and abandoned for more than 200 years, until 1865, when the ruins were bought by the nearby town of Sélestat. In 1882, the work on the reconstruction of the castle began but was forced to stop very early due to the lack of funding. In 1871 Alsace became a part of Germany and the city of Sélestat offered the castle ruins to Kaiser Wilhelm II. The German Emperor decided to proceed with the complete restoration of the castle as he wanted to mark symbolically his power over Alsace. He hired a German architect and archaeologist Bodo Ebhardt who rebuilt the castle after eight years of devoted work and thorough exploration of real life led in 16th century. After the Treaty of Versailles in 1919, the castle was once again in possession of France. 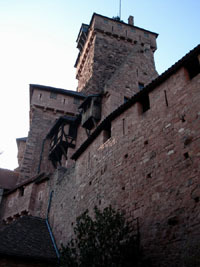 In 1993, Haut-Koenigsbourg was classified as a historical monument. The castle is open every day throughout the whole year, except on 1st January, 1st May and 25th Decembre. In January, February, November and December the ticket office is open from 9:45 to12:00 and 13:00 to 16:30; in March and October from 9:45 to 16:30; in April, May and September from 9:30 to 17:00, and in June, July and August from 9:30 to 18:00. Full ticket rate is 7.50 , reduced rate is 4.80  and for the children under 18, the entrance is for free. If you form a group of at least 20 people, you will pay 5.70  per person, while a school group (30 children in a group) has a group flat-rate 30.00 . Every first Sunday in month, from October to April, the visit for all visitors is free of charge. The castle staff offers guided tours which last approximately 90 minutes and cost 1, 50  per person. In addition, there are audio-guides that you can take at the ticket office. Behind the castle, there is a Medieval Garden created in 2001, offering a unique opportunity to discover what vegetables and fruits were grown in this period of history. In the period of French school holidays, the castle can be explored in a fun way - there are few characters like the cook, the nurse and the servant from 16th century which help children and their parents discover the life in the Middle Ages. The only disadvantage is the fact that this tour is being led in French language.